With municipal elections just days away, it is time to take another look at presidential approval polls through the end of October. After his first 100 days I showed that, despite increasing negative numbers, Maduro’s positive numbers were holding steady. I attributed this to the typical honeymoon period that presidents tend to enjoy. Here I repeat the analysis with twice as many polls (26) as the first time and twice the length of time (over 200 days). I start first with two graphical analyses: a first evaluates positive views of Maduro’s presidency (Figure 1); a second evaluates negative views (Figure 2). 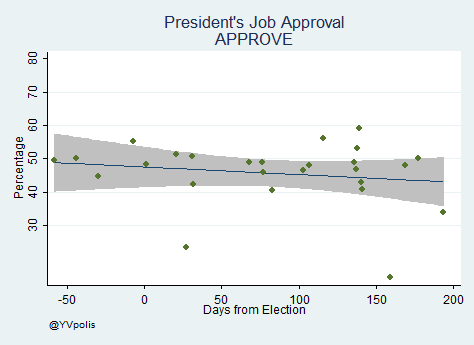 These figures show the values for presidential approval (in green dots) and a linear prediction based on the number of days since inauguration (the grey shadow is the 95% confidence interval). Once again we find two phenomena: positive evaluations remain relatively stable, while negative evaluations show a clear increase. In other words, the data show that as days go by there is an clear increase in the number of people dissatisfied, but a less clear reduction in those who support Maduro. A model that evaluates how the number of days affect positive approval. A model that evaluates how the number of days affect negative perception. A model that estimates how the number of days affect those with no opinion (Don’t Know/Don’t Answer). Table 1 shows that the passing of time did not significantly impact positive evaluations through the end of October. The coefficient of -0.023 although negative is not statistically different from zero. On average president Maduro has an approval of 47.5% and it remained relatively stable through this period. However, negative evaluations increased by 0.06% with each day that passed (which over 200 days amounts to 12%). 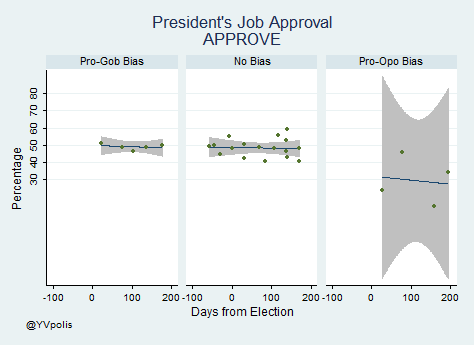 This increase came, as column three shows, through a decrease in the number of undecided, which explains why the positive numbers remain steady. From these pollsters the only one that is not classified based on the 2012 elections is Keller given that I had no data for this firm in that electoral cycle. However, based on past performance I left it in the no bias group because although it has mostly a pro-opposition bias this is very small and close to the 5% cut-off point I use. Table 2 shows the results of the linear regression when we include these bias variables. 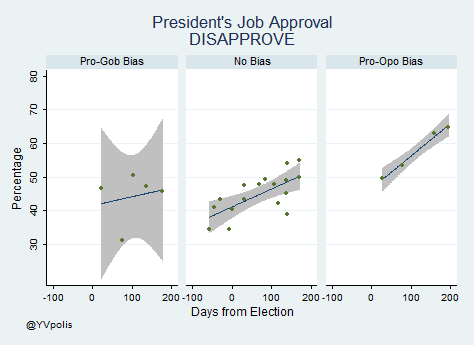 The most important finding here is that pro-opposition pollsters have a significant bias both with regards to positive and negative evaluation. A pro-opposition pollster will give Maduro 18 percentage points less of approval, while giving him 10 points more of disapproval, on average compared to other pollsters. Interestingly enough, the very few polls available from pro-government pollsters do not show a significant bias. I believe this is the case because some of the most extreme pro-government pollsters (Consultores 30.11, ICS) are not releasing approval polls and as such are not in this analysis. To show these findings graphically we can look at Figures 1 and 2 split by bias. 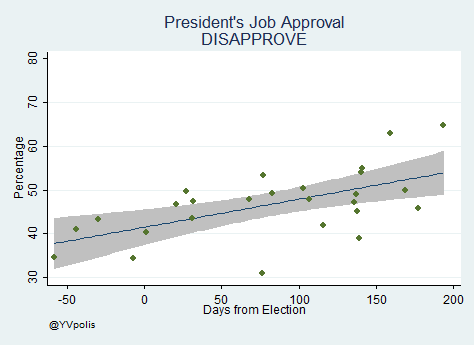 As Figures 3 and 4 show pro-opposition pollsters have a significant bias with regards to negative views regarding Maduro’s approval with not only numbers above the rest, but also a rate of increase much steeper. These numbers through the end of October suggest that Maduro still had a solid base of support at that time. The problem Maduro has confronted is that negative evaluation continues to climb and has started to erode his support. The opposition has focused on the idea that Maduro is a very unpopular president. However they have been relatively unsuccessful in undermining Maduro’s support. Given that this sector seems to be relatively static at 47%, this gives the opposition very little room to build a majority. Their focus on the idea that Maduro is unpopular presents a problem for the elections. What will the opposition leadership do if the government does well on Sunday? The possibility of this scenario occurring is highly likely not only because the government still has considerable support, but also because Chavismo has a strong get-out-the vote machinery. Furthermore, the polls analysed here only cover the months through the end of October. Since then much has happened in Venezuelan politics. Maduro obtained the enabling law he had solicited for months. However “dirty” the process may have been (pro-government deputies voted to strip an opposition deputy’s parliamentary immunity which gave them, with the vote of her substitute, the 3/5ths needed to pass the law), it was perceived as a victory for the president. Maduro also strongly sought to intervene strongly in the economy under the guise of a “war on speculation” included forced price reductions in consumer goods. These policy events amount to what in the United States is often called an “October surprise,” i.e. a series of events that happen the month prior to the election and which have the potential to seriously impact the result.